It takes about ten years for a coconut palm tree to mature. Ten years will be just about right, that's when I plan on moving to Ambergris Caye. 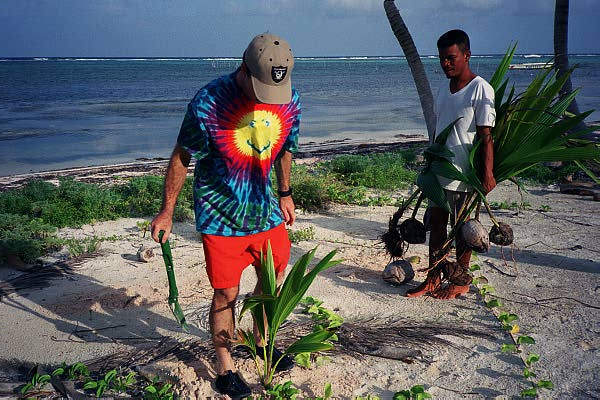 When I last visited Ambergris Caye in August 2001, I wanted to try and plant some palm trees up at North Basil Jones. There were numerous spots, where trees were gone due to hurricanes and Lethal yellowing. 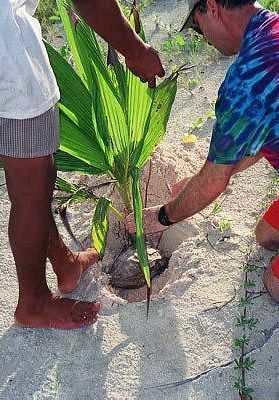 But let's get on to planting Coconut Palms. Starting with the seed or coconut, Number one rule for selection of a healthy seed is it must have water inside it. Just shake it, if you can't hear the coconut water, it won't work. It doesn't matter if it's heavy, light or what ever, if it doesn't have liquid in it, it's dead. The water is needed for the tree's first few months of life. 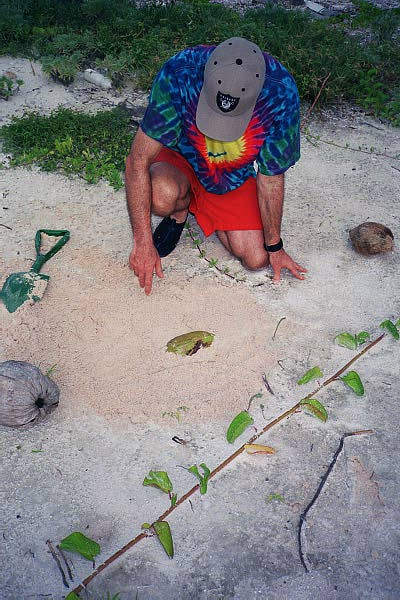 Seeds can have the husk or be just the bare coconut, either will work. Another way to plant, is to move already sprouted seeds-trees. Depending on the season, you can often find newly sprouted trees and move them to where you want them. Just be careful not to break the taproot as you pull it out of the sand. Then when you are planting sprouted seeds, you'll have to dig a deeper hole to accommodate the taproot, but the advantage is you know it's alive and which way it'll grow. 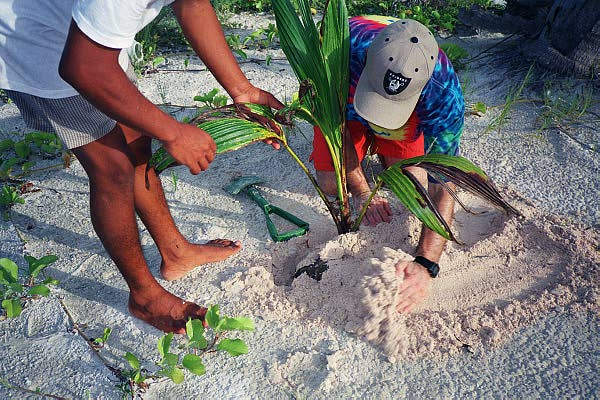 The average temperature for Coconut Palms needs to be about 75 degrees minimum, which is just right for Ambergris Caye. Just scoop out a small hole in the sand or well drained soil and lay the seed on its side, just as it'd fall, and cover it about two thirds up. The coconut has three lobes, put the side that has the two biggest ones towards the sky. It takes a month or so for the seed to sprout. If a shoot doesn't emerge after two months it is a sterile seed. The tap root will then emerge from the bottom and keep growing downwards until it finds a source of water. While the tap root is going down, fine feeder roots sprout laterally. 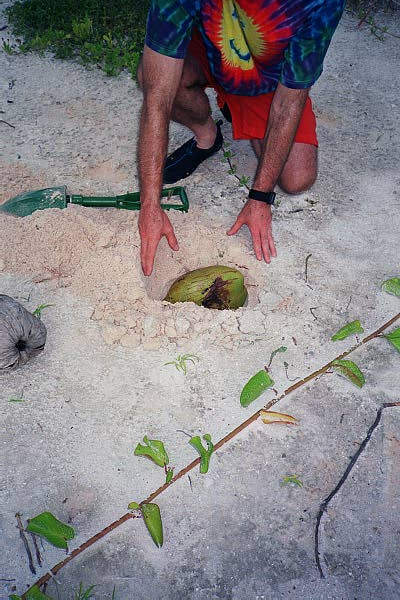 The nice thing about a coconut is that it has its own built in food and water supply for the first 3 to 4 months, so seedlings need no water until then. It is best to plant the seedlings in the dry season so that by the time the roots are established and the Internal food source is exhausted, the rainy season has started. And as to planting that's about all there is to it, very easy and very quick. Care after planting, is not really required, that's why they grow by themselves in so many places. But I would advocate helping them by planting or moving them in any area you may be, where there is a spot. Nature and time will do the rest and you'll be beautifying the beaches and islands for your future visits and everyone else too! There are many varieties of Palm and Coconut Palm trees, but the most predominate one in the Caribbean, Belize and Ambergris Caye is the Atlantic Tall. It is a beautiful and majestic tree, but has one major weakness, Lethal Yellowing a fatal disease. 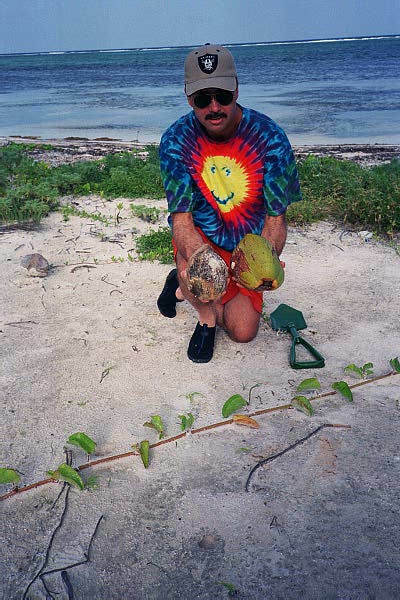 Since its first detection in Northern Belize in 1992, Lethal Yellowing has been destroying coconut palms at an alarming rate. 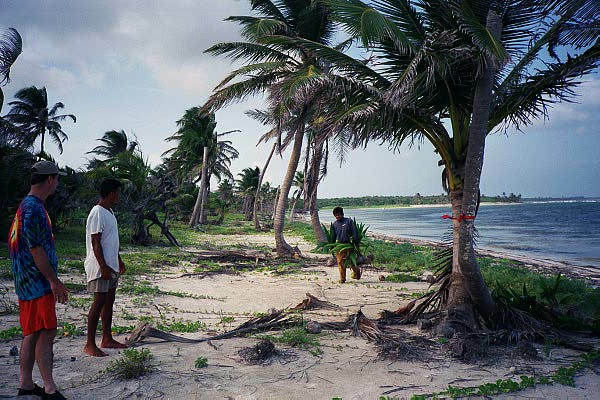 It is known to have destroyed more than 95% of the tall coconut palms in Corozal, and been been detected in most parts of Belize, including Ambergris Caye. 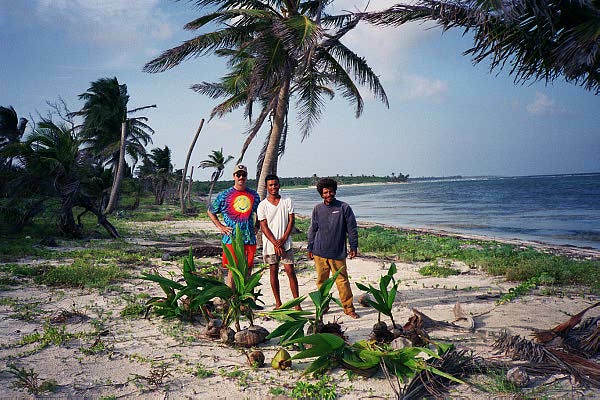 I saw quite a few dead trees on North Ambergris Caye when I was last there in August, 2001. The disease is caused by a small organism called a phytoplasma and is spread by small plant-sucking insects known as plant-hoppers. There is no effective cure for the disease and the palm will die within three to six months after the appearance of the first symptoms. There are known preventions, the most effective involve injections into the base of the tree with antibiotics. But it is fairly expensive and requires each and every tree to be treated. 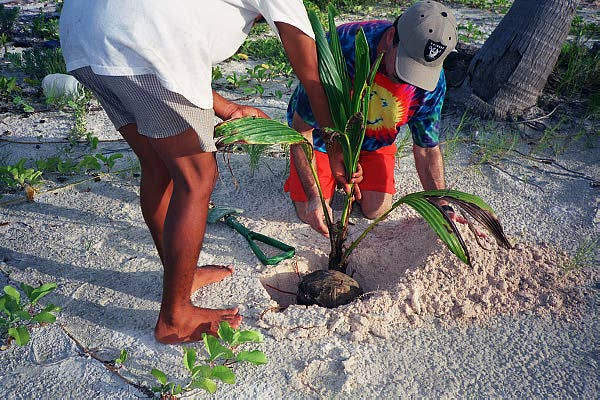 Planting and replanting coconut palms is necessary and there are two varieties that are highly resistant to Yellowing, the Malayan Dwarfs and Maypan Hybrid. The Dwarfs grow very slowly and take thirty to forty years to form those tall graceful trees you're used to. The best alternative is to plant the faster growing Maypan Hybrid. This variety is produced in special seed-gardens by crossing the highly-resistant Malayan Dwarf variety with the medium-resistant Panama Tall variety. Since these hybrids are special crosses, they can only be bought from limited suppliers, are relatively expensive, and their seeds do not stay true to type as they are hybrids. But once the Malayan Dwarfs and Maypan Hybrid are planted they'll grow beautifully for many years.